The City of Boulder, Colo., was in recognized with an award for a four-block section of Mapleton Avenue, a location of great importance to a vibrant city. 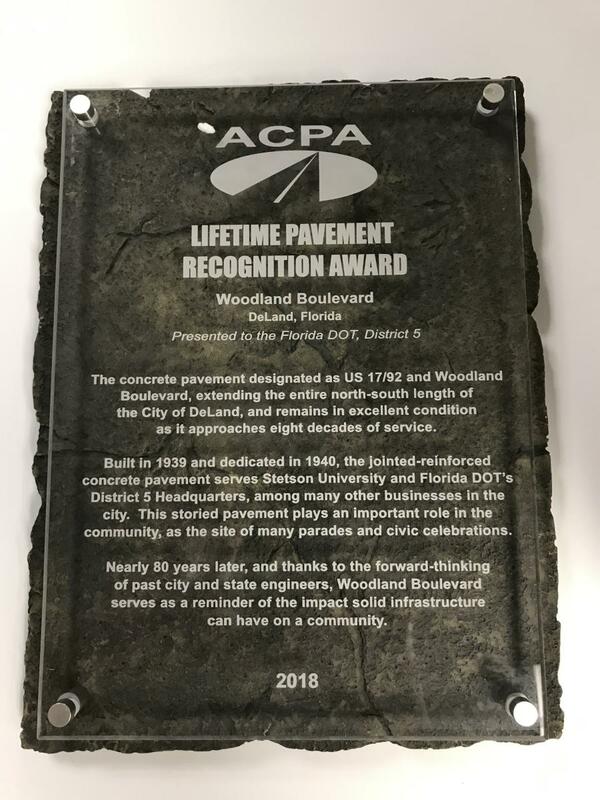 The American Concrete Pavement Association (ACPA) has recognized two long-life pavements with the association's Lifetime Pavement Recognition Award. 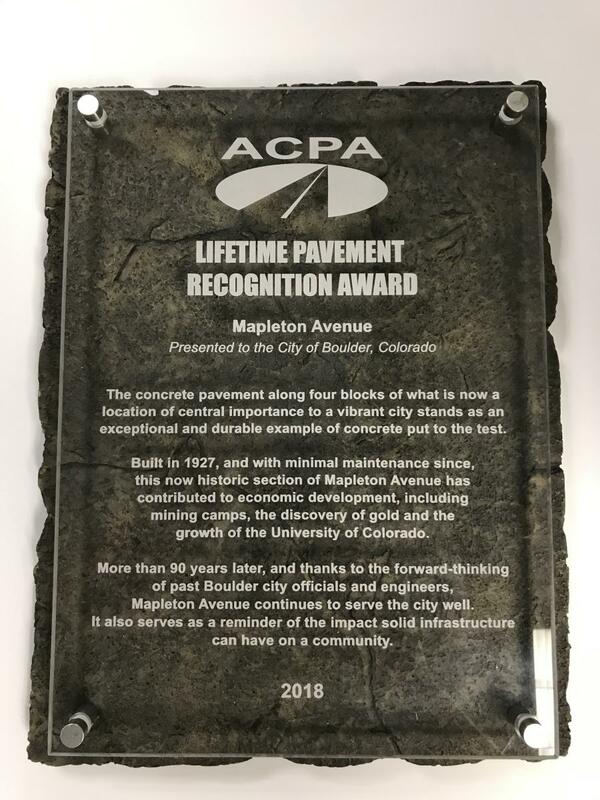 The City of Boulder, Colo., was in recognized with an award for a four-block section of Mapleton Avenue, a location of great importance to a vibrant city. Built in 1927, and with minimal maintenance since, the concrete pavement stands as an exceptional and durable example of concrete put to the test. This historic section of Mapleton Avenue has contributed to economic development, including mining camps, the discovery of gold, and the growth of the University of Colorado. "More than 90 years later, and thanks to the forward-thinking of past Boulder city officials and engineers, Mapleton Avenue continues to serve the city well," according to Gerald F. Voigt, ACPA president and CEO, who added, "It also serves as a reminder of the impact solid infrastructure can have on a community." A second award was presented to the Florida DOT, District 5, for Woodland Boulevard in DeLand, Fla. The concrete pavement designated as US 17/92 and Woodland Boulevard, extends the entire north-south length of the city of DeLand, and remains in excellent condition as it approaches eight decades of service. Built in 1939 and dedicated in 1940, the jointed-reinforced concrete pavement serves Stetson University and Florida DOT's District 5 Headquarters, along with many other businesses in the city. This storied pavement plays an important role in the community, as the site of many parades and civic celebrations. "Nearly 80 years later, and thanks to the foresight of past city and state engineers, Woodland Boulevard serves as a reminder of the impact solid infrastructure can have on a community," Voigt said. Awarded annually since 1994, this award is presented to the agency owner of an in-service concrete pavement that has demonstrated exceptional performance and service to its local community, state, and users. This recognition rotates annually between public market segments: highway, street/road, and airport. For more information about the American Concrete Pavement Association, call 847/966-2272 or visit www.acpa.org.